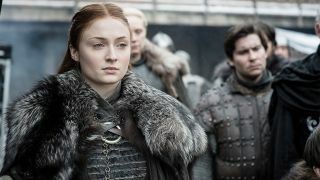 Does Sophie Turner’s last day of filming hint at Sansa leaving Winterfell in Game of Thrones season 8? With Game of Thrones season 8 just days away, little tidbits of information about the final season are surfacing all over the place. The latest of which might hint at Sansa Stark leaving Winterfell behind for somewhere a lot warmer… potential Game of Thrones spoilers to follow. When I sat down to talk to the Game of Thrones cast about season 8 earlier this year, I quizzed them on their final days of filming. While most actors managed to keep their reactions spoiler-free, Sophie Turner - who’s played Sansa Starkon the show since the very beginning - may have let something significant slip. The key bit of information here is that Turner’s last day of filming was in sunny Spain, AKA definitely not where the show shoots scenes for the cold and wintery Winterfell, the location where her character currently is as of the end of Game of Thrones season 7. It’s important to remember that just because Turner’s last day of filming was in Spain, that doesn’t mean this is Sansa’s final scene as scenes are usually shot out of order. But it does hint at Sansa leaving Winterfell behind at some point during the final season. Spain has been used as a Game of Thrones location in the past most prominently for Dorne, with the scenes depicting the Royal Palace of Dorne filmed at the Real Alcázar Palace in Seville. Does this mean the Lady of Winterfell will be leaving her furs at home in season 8 and travelling to Dorne for some reason? Maybe, but I’m not sure for what reason given all the Game of Thrones characters based in Dorne are either now dead or being held captive by Cersei in King’s Landing. Get ready for the final season with the ultimate Game of Thrones recap, or watch the video below to recap the show so far in just 16 minutes.